‘My headphones / they saved my life’. I love making mixes, although .mp3s have kind of killed the beautiful tangibility of the mix-tape/mix-cd…sharing a data-stick just ain’t the same. I don’t send as many mix-cds as I used to, though, because you can’t even be sure that people have cd-players anymore, right? If you want to make me really happy, send me a mix-cd. I have fantastic mix-cds from Sarah, Emma and Melissa that they probably long forgot they made for me…but I treasure, and when I listen to them I feel the person who made it for me very strongly through the music, just like Bjork says. I spend a lot of time wearing my headphones…..when I walk….to get to sleep….on public transport. These ones are beautiful Sennheiser ones which F bought me for my birthday last year. They sound incredible and definitely create a little solo-world of sonic bliss. I also get a kick out of the fact they look very much like the ones I had in the 1980s when I got my first Walkman. 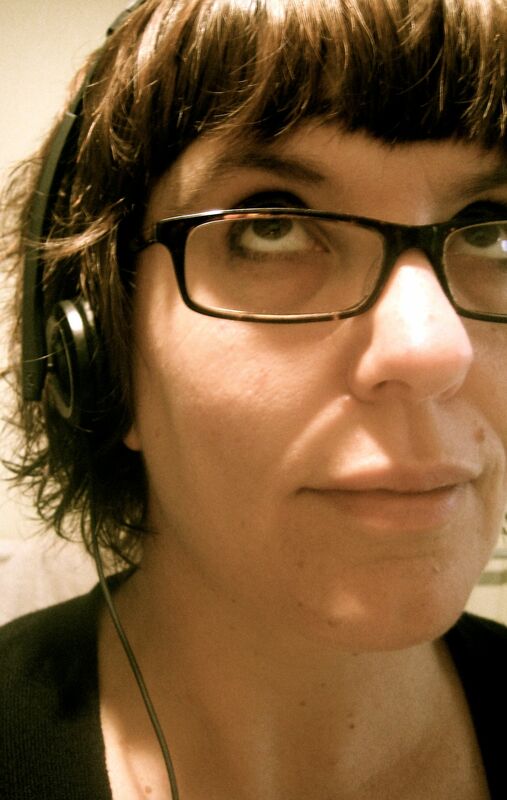 My friend Emma posted a couple of times recently about podcasts – read it HERE. I’ve found her podcast posts really helpful and have started listening to many thanks to Emma and the people who fed her some suggestions. If you enjoy Sound Opinions and love music esoterica and discovering new music, I can’t recommend highly enough the podcast ALL SONGS CONSIDERED. The hosts are wonderfully funny and sincere, the level of music geekery is high, and I haven’t listened to a single episode where I didn’t fall in love with at least one and often more of their selected songs. The focus of the show is SONGS not bands or albums – they are looking for stand-out songs, and they might even say ‘Don’t like anything else off this album, but this song is great.’ I appreciate the emphasis on the individual songs in the show. It’s like have a friend with great taste make you a mix-tape every week. It’s the only podcast which I sometimes re-listen to multiple times. For music-nerds only – if you are the sort of person who says ‘I don’t really have strong opinions about music – I like a bit of everything‘ this is not the show for you. I love history and biography – if you don’t, skip this paragraph. My other recent discovery is BBC GREAT LIVES podcast. In this show, host Mathew Parris invites a famous person who selects a ‘great life’ they would like to examine, then they, plus an expert on the selected subject, examine the life of that historical figure. It is ace – in a 30 minute show I can go from ignorance about a person, to being able to hold up my end of a conversation about them, should I need to! I say ‘historical figure’ but they often look at contemporary ‘great lives’ – the most contemporary I’ve hard so far was singer Kirsty McColl, who died in the 1990s. My favourite episodes so far were on Gertrude Stein, Wittgenstein, Dylan Thomas and Goya. I also love how the haughty host abruptly ends each podcast with a clipped ‘Goodbye’. I’m a Buddhist and there are two great Buddhist podcasts which I enjoy. They are both made by North American buddhist centres. The first is called DHARMA PODCAST and is by the Upaya Zen Centre – it has a zen-focus but is accessible to all. The sound quality is not always great as these are recorded live talks, but what it might lack in production values it makes up for in wisdom. The other one is The IDP PODCAST – this one is loosely based on Tibetan buddhism (as far as I can tell). It’s great – they have a really interesting array of speakers and subjects. Finally, a very new podcast – there are only a few episodes so far – is from the arts blog ‘My Love For You Is A Stampede of Horses’ – Meighan O’Toole who writes the blog interviews an artist/crafter. The podcast is called MY LOVE FOR YOU. These short interviews (20-30 minutes) are interesting, relaxed and they reflect on a lot of issues around being an artist in the 21st Century. The podcasts are supported beautifully with visual material and links, too. I hope she keeps doing them, because I like them very much. Whew! That’s it. I hope some of that was of interest. Your turn – can you recommend anything to me? Okay, really going now………. *in haughty BBC voice says* ‘Goodbye’. Wow. I love podcasts and will take great pleasure working through your list of recommendations – some I listen to already (endorse the greatness of Great Lives) – but most I doubt I’d ever have stumbled upon. The Buddhist ones appeal. And Transmission – gah! like a blow to the stomach. Bliss. Oh whew – you got the thing about feeling sick when hearing a deeply favourite song….I felt a bit nuts when I wrote that but thought it was worth the risk! Have you got any other UK podcasts you can recommend? Is there anything which is kind of like the John Peel Show used to be? Yay! New podcasts – I’m super keen to listen to the music, history and craft recommendations. If you like the examination of someone’s life try Desert Island Discs, for history I Ike Stuff you Missed in History and for walking or solitary working Selected Shorts is my fav. That comment was from me on my phone – no idea why it came up with that name. I was going to make you a mix tape a few months ago, but when I found out you didn’t have a tape player my plans fell apart. I didn’t even THINK about mix cds. The very last mix tape I received was from Simon in 2004 and I listened to that tape so much if I play it now it is stretched and all the songs sound wrong. So I just hold it in my hand sometimes and remember all the times I listened to it when we were first falling in love. Aw, that’s a beautiful thing indeed. Mix-tapes are love in plastic form. Highly recommend you check ou In Our Time with Melvyn Bragg – sounds like it would be up your street. Oh cool, thanks for the suggestions, Mel – will check them out!